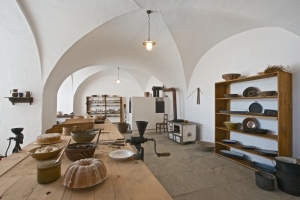 Exposition which presents the service rooms of the Kačina Chateau is located in the basement of the chateau, in authentic spaces which originally served this purpose. The exposition includes a number of rooms where activities essential to providing necessary services to the chateau’s inhabitants took place. Visitors can view the chateau laundry including a cauldron for boiling laundry and other smaller equipment. In the ironing room of the chateau, visitors can examine a nineteenth-century mangle and irons used during this period. In the original cellars of the chateau, the authentic equipment had to be renovated and reconstructed. One of the cellars served for storing wine in barrels and bottles, the other was used for keeping fruits and vegetables in boxes or on shelves, and while there is no ice in the ice room nowadays, original hooks testify to the fact that this room was used for storing meat, mainly game but also halves of pigs and the like. Undoubtedly the most interesting part of the service quarters is the chateau kitchen. Only a stone sink survives of its original equipment, but visitors will be able to admire a faithful replica of the original bread oven combined with a cooking stove and a chimney for smoking meats, kitchen furniture, and plenty of dishes, pots and pans, and various kitchen implements. Next to the kitchen is a pantry and a storage room for kitchen implements and dishes. Service quarters of the chateau also include a room where the cooks lived, fitted with period furnishings, and a woodshed with wood and tools used for preparing firewood. All these rooms have been reconstructed based on inheritance lists of the Choteks and using surviving objects that had been used by the Choteks at Kačina Chateau, with some additions from nineteenth-century items from museum’s collections. In preparing the exhibition, the original use of each of the rooms had been respected. This new exposition forms a functional whole with the representative salons on the ground floor of the chateau. In this way, visitors have a rare opportunity to appreciate the various aspects of both the ‘upstairs’ and ‘downstairs’ life in an aristocratic home.